The summer sun flashes through the trees as the big green “Super-Cab” bumps along the back-country road. Three gangly-legged kids “lounge” on the back bench with their knobby knees around their ears, while the sunshine blonde sits up front with Mom and Dad! 🙂 The 8-track tape skips occasionally, depending on the ruts in the road. The freshly washed and packed Skylark trailer is now covered in dust as the old truck climbs. A familiar clearing opens up in front of the caravan; a winding stream along one side, mountains looming close by. 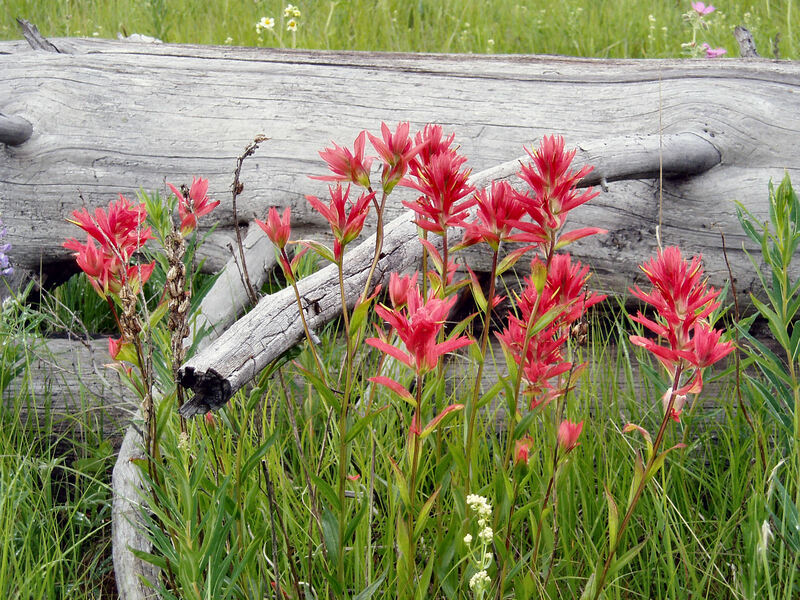 Indian paint brushes line the clearing among the dead fall. There’s a dirt “road” leading back further into the bush, two deep ruts that the old Super-Cab won’t be attempting. The perfect spot for the yearly camping vacation. There is the usual parental “discussion” as the trailer is parked and leveled – the four kids stay clear and explore to see if anything’s changed from the previous year. The stream has cut a deeper groove into the earth. Fresh moose “terds” along a new trail. A few more old campfire embers in varying spots across the clearing. Their “secret” spot no longer as secret. Days out there are filled with exploring. They hike up the nearby mountain, to the top of the tree-line. Even the little blonde one makes it all the way up! The climb on the hot summer day leaves them anxious to get back into the coolness of the forest. The freckled one notices her sweater is missing when they arrive back at camp. Dad considers and allows the two oldest to go back up and get it. They are excited that he trusts them and believes they can get their faster on their own. It is a big step for those two – not treated as children. They recover the now-marmot-chewed sweater and beam with pride. Rainy days mean board games around the tiny square table in the trailer. Chocolate puffed wheat squares and hot chocolate are eagerly devoured. The small furnace in the trailer and those 6 bodies crowded together make the windows fog up as the rain comes down. The summer storm doesn’t last long, and by early evening, they are tromping through the wet grass in rubber boots that Mom is always wise enough to bring along. Evening campfires mean roasted marshmallows and stories of camping days past. As the sun goes down, dark shapes flit through the sky, gathering their insect breakfasts. The oldest one scrunches down in her lawn chair as low as she can, melting the bottoms of her running shoes when getting her feet too close to the fire. As the stars come out and the yawns get bigger, Mom heats up a pan of water and they each take turns washing the day’s dirt and sticky marshmallow away. Dad kicks up the furnace as they climb into warm pajamas. The two littlest climb up on the bunk and are instantly asleep. The two oldest make way as Mom converts that table into a bed just big enough for the two of them. Mom notices that soon, those two will be sleeping out in tent on these trips, they’re almost too big for that trailer now. When did they get so big? My kind of music – my human’s kind of livin’. Though his trailer is a tent he sure loves that life. Your post makes him want to pack the pickup.